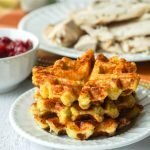 These low carb turkey stuffing waffles are the perfect way to eat those Thanksgiving leftovers. Easy to whip up and you can eat them for breakfast, lunch or dinner. Only 1.4g net carbs each! Heat up your waffle iron and melt a little butter in the microwave. Mix all the ingredients except the butter in a large bowl. Use the butter to grease the waffle iron. Take out 1/4 of the batter and add to the center of the waffle iron. Close the lid and wait until done. NOTE: This recipe makes 4 smaller waffles. The smaller waffles work best in the waffle iron so don't try to make one big one as it will be hard to get out. Top with turkey or cranberry sauce or whatever you like.